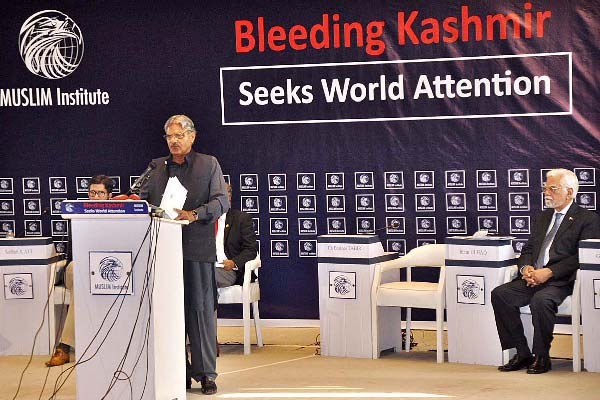 ISLAMABAD, Aug 2 (APP): Federal Minister for Kashmir Affairs Chaudhry Barjees Tahir Tuesday said United Nations should put pressure on Indian authorities to stop violence against innocent Kashmiri people. Attention” organized by Muslim Institute, he said peace and stability in South Asia could not be ensured unless maintaining peace in Kashmir. “We are celebrating 70th Independence Day and my heart feels pain for the Kashmiri people who have been facing worst kind of atrocities for the last seven decades”. He said the intensity and style of violence of the Indian forces was becoming worse day by day adding use of lethal weapons had injured 5500 innocent Kashmiris which making many of them life time blind and 72 dead. Speaking on the occasion, Senator Gen ® Abdul Qayyum said the government had a clear cut policy about Kashmir and was raising the Kashmir issue at all the international forums. He said that Pakistan would never compromise on the issue of Kashmir and would stand always with the Kashmiri people for their efforts toward right to self determination. Former Minister for Foreign Affairs Inam ul Haq on the occasion said that Pakistan should not be apologetic in pleading the case of innocent Kashmiri people. It is the right and obligation of Pakistan to highlight the Kashmir issue at every forum unless its resolution. (ISSI), Masood Khan, Convener All Parties Hurriyet Conference (APHC) Ghulam Muhammad Safi and Chairman Muslim Institute Sahibzada Sultan Ahmad Ali also spoke on the occasion.